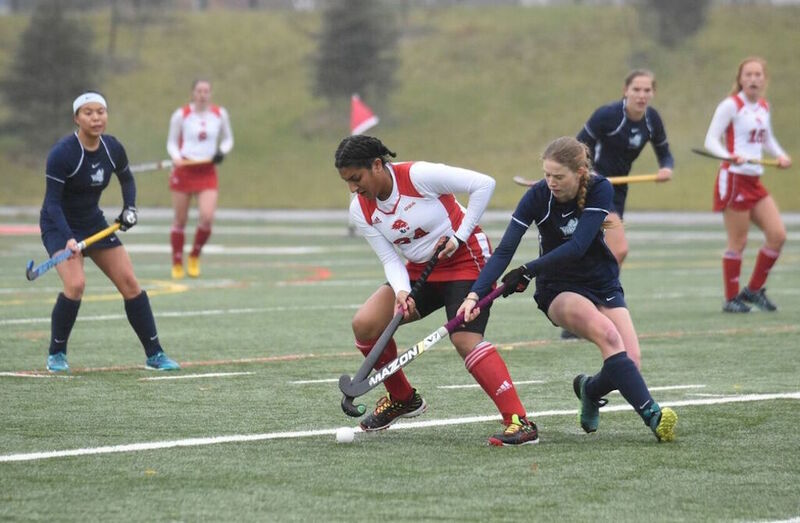 Erin Dawson scored both goals as the Victoria Vikes opened the 2018 U SPORTS Women’s Field Hockey Championship with a hard-fought 2-1 win over the York Lions on Friday at Alumni Field. Playing on a cold day with drizzling rain, the game started slowly with both teams trading possessions early on. The Lions had the first good scoring opportunity 10 minutes into the game when forward Jaslan Stirling set up Prava Sandhu inside the box after deeking around a Vikes defender. Sandhu was foiled by Vikes goalie Robin Fleming who made the first big save of the game to keep the score tied 0-0. Fleming made another highlight-reel save at the 16-minute mark, as she stoned Stirling this time after the forward snuck behind the Victoria defence and ripped a shot that the netminder sprawled to stop. A few minutes later, the Vikes looked dangerous in the Lions end, but a crossing pass was deftly broken up by Lions defender Sydney McFaul to shut down the scoring chance. UVic opened the scoring with four minutes left in the first half when Dawson netted the first goal of the championship. Dawson worked her way around several Lions defenders and went high to the top right corner of the net past Lions goalie Alycia Gray to make it 1-0. The home team was quick to respond, as Stirling found Lions forward Amber Sandhu open in front of the net just two minutes later. Sandhu buried the crossing pass behind Fleming to send the game tied 1-1 into halftime. The first half showed how evenly matched the two teams are as the Lions outshot the Vikes 5-3, but the game was back and forth with both teams spending time in the oppositions end of the field. After a defensive start for both teams in the second half, the Vikes had a glorious scoring chance with 13 minutes left in the game during a scramble after a penalty corner, but a deflected shot went over high over the net. Victoria was able to take the lead just minutes later though, when Dawson netted her second goal of the game to put the Canada West champs up 2-1. Gray kept the Lions in the game with a big save on U SPORTS Player of the Year Anna Mollenhauer with just under ten minutes remaining, as Mollenhauer had two great scoring chances in row, the first kicked out by Gray and the second fired off the crossbar. The Vikes continued to pressure the Lions and kept the home team pinned in their own end throughout the latter stages of the second-half. Midfielder Frankie St. Louis had the last good scoring chance for the Lions but a shot from 20 yards out was deflected wide by a Vikes defender in front of the net. Neither team scored the rest of the way and the Vikes took Game 1 by a score of 2-1. The Vikes outshot the Lions 10-9 in the game and showed why they were the CW champions this season with a strong second half that was spent for a large portion in the Lions end. Goal scorers Dawson and Sandhu were named Players of the Game for Victoria and York respectively.